As Simple as Black and White? Bit of a quicky this week. School is back in session, and I can’t wait to relay info about my Global Warming class! But first, I wanted to post about the latest and greatest idea from the White House– White Roofs. I freaking love this idea. 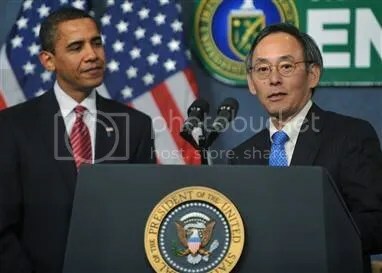 The new Secretary of Energy, Dr. Steven Chu, is my hero. Also I’ll just take this opportunity to plug Obama– how amazing it is to feel represented! Ok, so on to this white roof proposal. Paint your roof white. That’s it! This so called “cool roof” idea is rooted in the fundamentals of light and reflection. Black absorbs light, transfering it to heat. White reflects it. Albedo is the scientific term for how reflective a surface is. Glaciers, for example, have a high albedo. Pretty cool stuff, huh? Partially why I think this appeals to me so much is because it is our world, slant. It is taking what we are used to, black roofs, and tilting it conceptually just enough so that it is purposeful. It is also a quest for the whys. Why are roofs black? Can they be white? What if they are? What if everyone partook in a quest for the whys? Like a 2 year old, discovering the world for the first time. What if instead of answering, “I don’t know,” we answered, “let’s find out”? If enough changes are made simply with the environment in mind, well, I don’t know what would happen, but it makes me feel optimistic, excited, and yes, hopeful. I think this is a great idea, however I am a bit dubious that in the calculation of the heat reduction they included the effect on nature and global warming that manufacturing of so much paint (or other products used) would have.